September was a big month in our house, our youngest - Maegan (age 4) started reception at primary school, just like her big brother (Blake age 6) she started school straight from 3 days at preschool. Of course 5 days a week has come as a shock, to all of us, but its also been extremely exhausting and having 2 children in primary school - its come with a number of bugs. Since September, our little family has suffered a stomach bug as well as a cold virus that seems to linger for about 3 weeks! - needless to say we've all been poorly more than well - or at least thats the way it feels! Beat the bugs and prepare for cold and flu season with Dettol surface cleanser to kill 99.9% of bacteria. 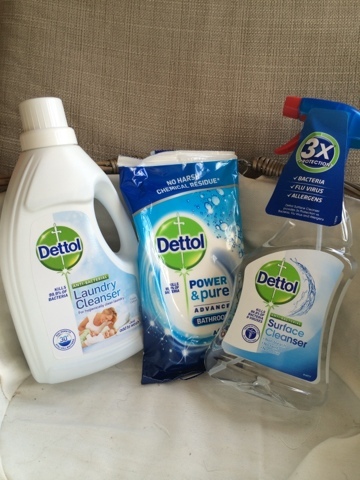 I've been using Dettol products to help me get rid of all the bugs floating around our home! I love that Dettol surface cleanser protects against bacteria, flu virus and allergens - in our house we have a few allergy sufferers and asthmatics so anything that can help keep allergens under control is a plus. The bathroom wipes have come in very handy - I always worry with stomach bugs as they can just keep going round the family so these are just a quick and convenient way to help. The laundry cleanser is actually rather clever - as we tend to wash on a lower temperature, not all bugs disappear in the wash - so a bit of laundry cleanser can really help to kill of any bugs. I was a little hesitant the first time we used it as our laundry products are all non bio and skin foundation approved - however for our family, we've got on well with the laundry cleanser. The Dettol website has some great tips. Incidentally - Dettol are running a Care For Your Bear on Twitter @DettoTeddy #careforyourbear with the laundry cleanser. I've got a Pinterest board full of tips for beating the common cold this winter that you might like to see. Disclaimer - Dettol sent me some products to use in my article. Christmas Gift Guide 2015 Part One.